Armenia has accused Azerbaijan of trying to question the outcome of a recent internationally mediated meeting of the two countries’ leaders during which a number of measures related to security in the Nagorno Karabakh conflict zone were reportedly agreed. Speaking at the 7th European Union and Eastern Partnership Foreign Ministers’ Meeting in Brussels on Monday, Armenian Minister of Foreign Affairs Edward Nalbandian, in particular, referred to the May 16 meeting of President Serzh Sargsyan of Armenia and President Ilham Aliyev of Azerbaijan in Vienna, Austria, that was held with the mediation of the OSCE Minsk Group co-chairmanship represented by the United States, Russia and France. It was the first contact of the two South Caucasus leaders after brief hostilities in Karabakh at the beginning of April that claimed the lives of scores of soldiers as well as a number of civilians on both sides. “Regrettably, only days after the meeting Azerbaijani officials are making futile attempts to cast doubt on its outcome, presenting their own distorted interpretations contradicting the statement made on the results of the meeting by the high representatives of the Co-Chair countries. 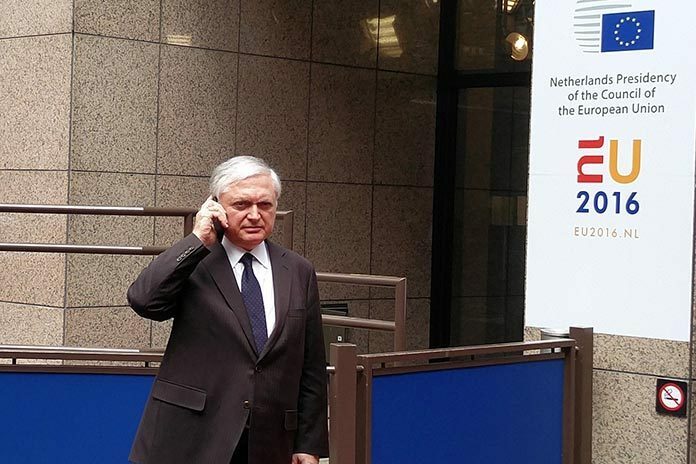 By fabricated accusations, Baku is trying to distract the attention of the international community from crimes committed by Azerbaijani Armed Forces, the vivid facts of the gross violations by Azerbaijan of the International Humanitarian Law and International Human Rights Law,” Nalbandian said. “Armenia together with the Co-Chair countries will do its utmost for the implementation of the agreements reached in Vienna and to continue efforts for the exclusively peaceful settlement of the Nagorno-Karabakh conflict,” the top Armenian diplomat emphasized. The meeting in Brussels was chaired by EU High Representative for Foreign Affairs and Security Policy, European Commission Vice-President Federica Mogherini and brought together foreign ministers from Armenia, Azerbaijan, Belarus, Georgia, Moldova and Ukraine, as well as from the EU member states. Commissioner for European Neighborhood Policy and Enlargement Negotiations Johannes Hahn also attended the event.